Your business vision, our website expertise. It can be a really tough choice choosing someone to recreate your message and vision online. Who do you trust to use their website expertise and produce a system that relays your message and is reflective of you and your brand? It needs to look good, with a strategic system behind it to connect with and build your audience, and create income for your business. You need someone with a great eye for detail and design, who has a good track record in creating quality sites which reflect the personality and message of their clients. It’s important that anyone you hire understands you and your business and will co-create it with you. Your website needs to holds the interest of visitors, and inspire them to act. After all, there’s no point having a website unless its going to help bring you business. This is where GLO (Get Launched Online), will help you. Your business vision, our website expertise. We help you with the whole of your website story, the BIG PICTURE. Together we will plan, create and deliver your vision online, ensuring that you have a marketable website that stands out from the crowd, and works for you, your business and your audience. We take pride in our work, and we want you to love what we do as much as we do. We know we’re good, but don’t just take our word for it, take a look through our portfolio and testimonials, and find out what happy clients are saying about our service. We will agree a deadline, and stick to it – Yes, exactly as it sounds. We will be realistic with our delivery dates, and provided we have all the information we need from you, we will guarantee you will get your website on time, and on budget. We will be here for you even once your site is live and published – We’re not the cut and run type. We feel that often tweaks and changes are needed once the site is live, maybe even a few months down the road, so once you become a customer of ours, we’ll be available to you when you need us. We will guide you through how your site works – We are firm believers that you should always retain control of your site, your hosting and your domain, whilst we can and do look after all of that for you, we will happily and gently guide you through everything you need to know about your site and the strategy behind it, to ensure peace of mind. 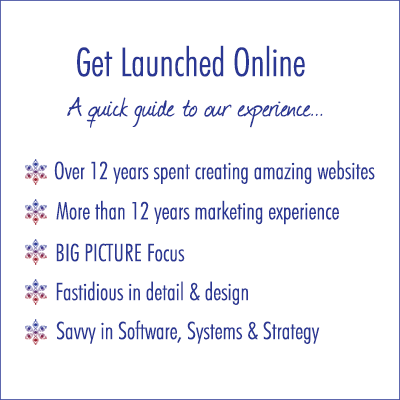 Get Launched Online was founded by Kerry Anne Orr; business woman, systems coach, web marketing wizard, and not-so-closet geek who has over 12 years experience creating amazing websites, developing systems and marketing businesses online. Kerry Anne is a BIG Picture strategist, who understands the importance of good design coupled with robust and secure systems. Having spent the last twelve years working with owner managed businesses, she gets to truly understand her clients needs, and what it takes for them to stand out online. 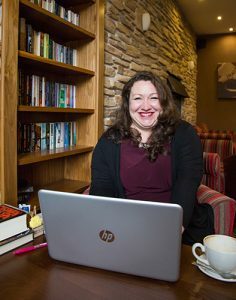 With a background in project management, training and systems, and having run a number of her own businesses, Kerry has a wealth of business and marketing experience, and understands the need for simplicity and clarity. As a creative person, who has a keen eye for detail and design, Kerry is passionate about creating beautiful websites that reflect her clients’ personalities and visions to appeal directly to their audience. Call 01581 464046 to find out more or click here to contact us.